This No-Bake Cinnamon Peanut Butter Pie is perfectly creamy & so easy no-bake cinnamon peanut butter mousse pie with a graham cracker crust topped with chocolate and cinnamon chips. It’s Friday and we’re celebrating with some pie! Don’t worry, I’m still on a healthy kick but I figured we can only see a certain number of salads and smoothies before we start getting bored — so instead of boycotting desserts, I’m going to embrace them with a few changes to make them lighter without sacrificing on the flavor. 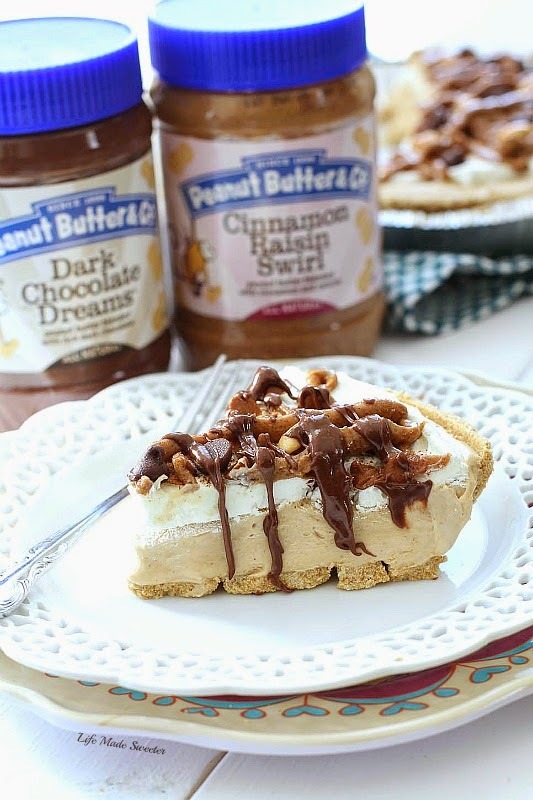 This Cinnamon Peanut Butter Pie is just the indulgent treat you need after a long week. I’m a sucker for skinny desserts so I made a few swaps to make this with lighter ingredients that you won’t even miss out on! It’s also no-bake and super easy to whip up – especially if you use a pre-made reduced fat graham cracker pie crust like I did here. 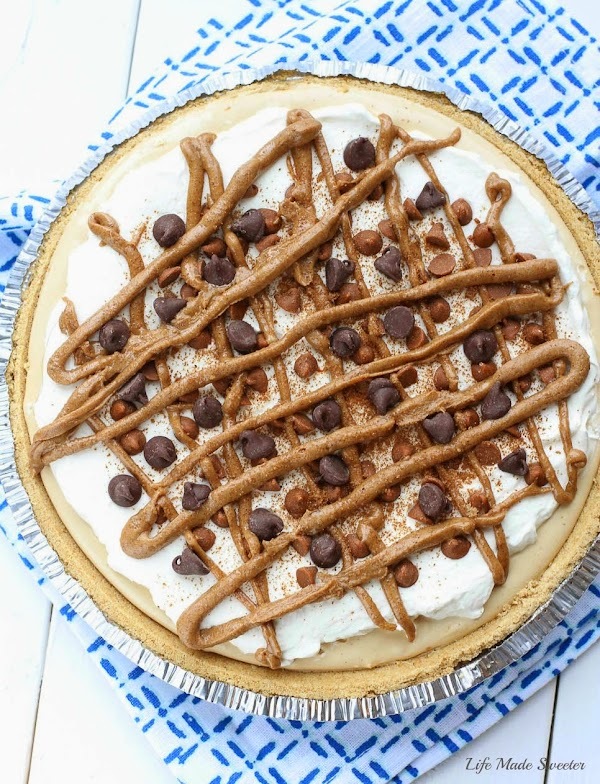 The filling of the pie is made with fat-free cream cheese, fat-free whipped topping, and Cinnamon Raisin Swirl Peanut Butter from Peanut Butter & Co.
Have you guys seen all the flavors from Peanut Butter & Co? Back in the fall, they sent me a box full of different flavored peanut butters to try and they are SO good! They offer natural gourmet peanut butters and the best part is that all of their peanut butters are kosher, gluten-free and vegan (except for the Bees Knees which is vegetarian). It was so hard for me to pick a favorite but since it was right before the holidays, I was craving all things cinnamon so I used the Cinnamon Raisin Swirl Peanut Butter to make this pie filling and am finally getting a chance to share it with you guys now. This pie is a true peanut butter and cinnamon lover’s dream dessert. I topped it off with some chopped peanuts, chocolate chips, cinnamon chips and a drizzle of the Cinnamon Raisin Peanut Butter and Dark Chocolate Dreams Peanut Butter. With no oven needed and a quick prep time, it’s the perfect decadent treat to celebrate with! 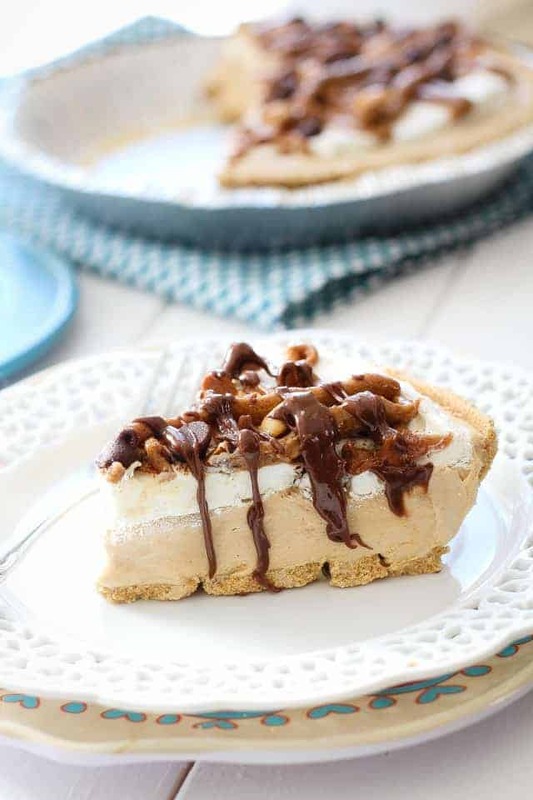 A delicious and easy no-bake pie with a graham cracker crust topped with a lighter cinnamon peanut butter mousse and whipped topping. Chocolate and cinnamon chips along with a dark chocolate peanut butter drizzle make this a decadent treat perfect for any peanut butter lover. In the bowl of stand mixer or hand mixer, beat together cream cheese and powdered sugar until smooth. Add in peanut butter and vanilla extract and mix until combined. Fold in half (about 1 1/2 cups) whipped topping and mix until smooth. Pour filling into graham cracker pie crust and spread evenly. Layer with the rest of the whipped topping (about 1 1/2 cups) and smooth out with an angled spatula. Refrigerate for 3-4 hours or until set. Top with chopped peanuts, chocolate chips, cinnamon chips chips and peanut butter chips if desired. To add a peanut butter drizzle, microwave 1/4 - 1/3 cup of peanut butter for 10 seconds and spoon into a zip-top bag. Cut a tiny corner of bag off and drizzle on to pie. Repeat with dark chocolate peanut butter if desired.